Over 4,27o books and articles! Read details below and consider the vast amount of material on this disk! Many books on Baptist History, KJV Defense, and Bible Commentary! Complete Books by Burgon, Larkin, Scroggie, Sir Robert Anderson, Foxe, Armitage, Backus, Miller, Ironside, Waite, Cloud, Moorman, Hills, and many more. Over 4,270 select books and articles, this roughly 3.5 gigabyte library is the largest fundamentalist research database available. It is a contemporary church issues research library, a preacher’s information database, a Baptist history library, a Bible Version library, a library of dispensational Bible commentaries, and much more. This is not merely a batch of material thrown on a disk. Everything in this electronic library is carefully selected to be of benefit to a Bible-believer in his Christian life and ministry. The vast majority of this information is unique to the Fundamental Baptist Digital Library and cannot be obtained from any other source. If the library contained only the books - the cost would be less than 65 cents per book! But there is so much more! (Lower price available if you own version 7.0 or 2014. 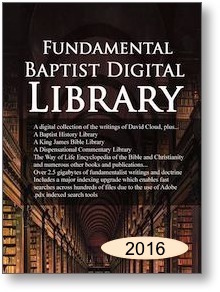 What’s in the Jan-2016 Edition of the Fundamental Baptist Digital Library? • Topical Library of 318 hand-selected reports sorted by category. • Library of over 2,620 FBIS (Fundamental Baptist Information Service) articles that have been published over the years. • The entire 76 volume Free eBook series in pdf, mobi, and ePub formats. • 337 issues of O Timothy magazine. • Fast section and global search using Adobe Indexed Catalog (pdx) files. • Most of the material in this database is in standard PDF format. The Way of Life Free eBook series contains each book in pdf, mobi (Kindle), and ePub formats. There are two videos that are in mp4 format. Each major section is searchable using the included Adobe index search tool (.pdx file) See example here. for example. Additionally, a global search index is included so that the entire library may be searched. There is so much information in this library the user should learn how to use advanced searches in order to obtain targeted search results. • THE WAY OF LIFE ENCYCLOPEDIA OF THE BIBLE & CHRISTIANITY. 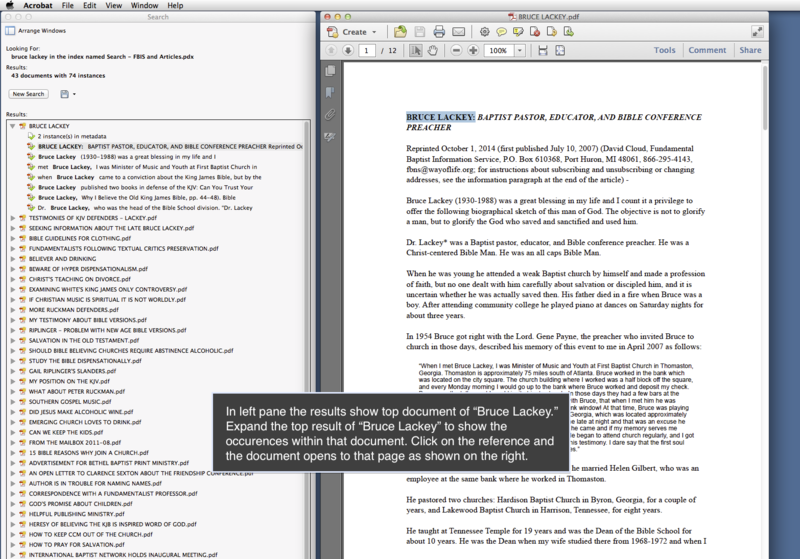 Twenty-five years of research has gone into this one-of-a-kind reference tool. It is the only Bible dictionary/encyclopedia that is written by a Fundamental Baptist and based strictly upon the King James Bible. It is a complete dictionary of biblical terminology and also features many other areas of research not often covered in Bible reference volumes. It is extremely practical and useful for the ministry. Subjects include Bible Texts and Versions, Denominations, Cults, Christian Movements, Typology, the Church, Social Issues and Practical Christian Living, Bible Prophecy, and Old English Terminology. This work does not correct the Authorized Version of the Bible, nor does it undermine the fundamental Baptist's doctrines and practices as many study tools do. The encyclopedia contains over 5,500 entries and 6,000 cross references. • Every issue of the monthly O Timothy Magazine from 1984 to Jan 2015. • The complete (as of Dec. 2015) Way of Life free eBook Series (70+ books) in pdf, mobi (Kindle), and ePub formats. • Videos: Transformation Power of CCM, and The Foreign Spirit of Contemporary Worship Music. • Issues of The Calvary Contender, 1984 to 2005. - plus dozens of other important articles on this topic. - Will The Church Pass Through the Tribulation by Henry Thiessen). (Upgrade price available if you own version 7.0 or 2014.